Mission Statement: We strive to be more than just “A Place to Stay. Our goal is to make Our Home...Your Home ...away from home. We place a high value on maintaining a clean, safe, relaxed, and community oriented environment where everyone feels welcomed. Our guiding principle is integrity and we believe mutual respect is the key to our success. After over 15 years in business we have undergone a major renovation: from new beds in the rooms to the addition of lockers in the dorms, newly decorated common areas, expanded dining area and the building of a fourth shared bathroom. What was once just a backpacker’s hostel is now our home. Our story began here at the hostel 2 years ago when after travelling for 18 months, Kerry came here as a guest and met the owner, a confirmed bachelor, Raul. They feel in love and married a few months later and began their journey as husband and wife and business partners to develop a new improved Place to Stay. Together they make a powerful team with Raul’s intimate knowledge of his native homeland Guatemala and 17 years working in tourism and Kerry’s extensive experience as a traveler they have created A Place to Stay which is a haven for travelers craving a comfortable place that feels like home. 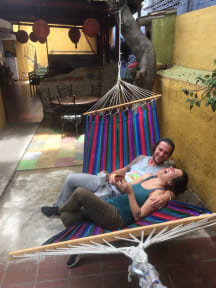 Since this is our home we are not your typical hostel/hotel therefore the types of people that enjoy what we have to offer are: couples traveling on a budget, families, and solo travelers who want a clean, safe and affordable place where they can meet others. Our small size (maximum of 20 people with 9 guest rooms) makes for a cozy environment and our shared kitchen and lounge area promote interaction among our guests. It’s important that you like animals as we have pet cats and bunny rabbits; the animals roam free around our property and are very friendly. If you have allergies you should be fine as our pets are not allowed inside the guest rooms. While you are a guest in our home we require you respect our House Rules which includes no smoking or drugs on the property and a curfew of midnight (00:00) every night with no exceptions. Those not back by midnight will not be allowed in until we re-open at 7:00 in the morning; no refunds or discounts. Come join us for a night, a week, or a month and find more than A Place to Stay…find your home away from home! Late check in after 19:00 requires payment of first night prior to arrival. If your arrival is after this time please contact us to make arrangements to ensure your reservation is guaranteed for late check in. We are a smoke and drug free environment, no smoking anywhere on the property. Important to note that we have pet cats and rabbits that roam free in the common areas. Breakfast is served exclusively between 9.00 – 10.00 am. You must ring the bell outside the door of A Place To Stay Hostel to enter the premises, someone is here to answer the door from 7:00-23:59. We lock the front door at midnight with no re-entry to enforce the curfew 00:00. Minors (under 18) are not allowed to lodge in dorms. However they are welcome to lodge in our private rooms. My husband and I stayed with Raul for three nights in Antigua. Although we didn't have the pleasure of meeting his wife, Kerry was incredibly helpful leading up to our trip, helping to book us a private transfer from the airport to our hostel and advising us on different activities in the area. Cats are lovely and well behaved, showers are warm, and the bedrooms are clean and tidy. Hot water, strong wifi connection, lovey pets roaming around, friendly & helpful staff who organize tours at good prices (not taking an extra cut). Hostel had a midnight curfew which worked well for me & kept out wild party goers (I needed a decent sleep). Kitchen free to use & place was very clean. Nice fluffy towels. FANTASTIC! We had a wonderful stay at A Place to Stay. We stayed a week and we didn’t want to leave at the end of it. The owners are wonderful and so so helpful. They have beautiful cats and a rabbit who chill out in the common area. Would highly recommend. Great hostel with super friendly staff/family. My sister and I had a late shuttle and they even let us check out of the room in the evening and arranged all of our transportation. They are so accommodating and sweet! Thanks for a great stay! We stayed at the hostel for around 10 days and we had a wonderful experience! The rooms and the facilities are just perfect and very clean. The common area is lovely and the company of the cats and a rabbit is wonderful! The staff is very friendly and helpful and the omelette con queso in the morning is delicious :) The staff helped to us a lot planning our trips to the Vulcano and surrounding area. Note that it is not a party hostel and you cannot come back after 12pm. Highly recommended! A Place to Stay is a lovely hostel near the bus stop in Antigua. What made it so special was the very welcoming and accommodating staff there, as well as all their furry friends! They have many many cats and a rabbit who are all very friendly. This is not a young backpacker party hostel which I enjoyed, but it is still easy to meet people. It's a nice place to relax, or to stay a long time since they also have a kitchen for guests to use. I loved my stay at A Place to Stay! Our home away from home! Some of the most generous and honest people we've met in Guatemala, incredibly helpful and went out of their way to connect us with the best tours for the lowest prices, cook up delicious breakfasts each day, and really made sure we had a great time. Very safe, multiple bathrooms with great hot showers. We'll miss the really friendly cats (and large bunny) and only wish we could have stayed longer! Raul was a great host. Very polite and we'll mannered, helpful with anything we needed. The rooms are basic but clean and tidy however the bed was hard. The only thing I did not like was the very basic "included breakfast" , the one morning was pancakes and the second morning was bread with jam/peanut butter. Great place if you want something quiet. If you are into partying this is not the place for you but a good bed and a good breakfast and very helpful staff then you'll like it here.